Image size is 8" x 10"
In her hometown of North Providence, R.I., Carla D’aguanno realized she was meant to be an artist at a very young age. She recalls her high school teachers commissioning her to paint their children and grandchildren in high school. After graduating from Otis/Parsons School of Design with a Bachelor’s Degree in Fine Art, she began her career as a movie poster artist, illustrating posters for movie advertisement companies in Los Angeles. She eventually returned to her native New England and began illustrating young adult and romance covers for New York publishing companies including Bantam, Doubleday, Pocket Books and Harper Collins. After Carla was married she soon realized that she needed to paint from the heart and the subjects of her affection. Thus, she turned to fine art and began painting children, animals and Western genre. Her love for the Pioneer days of the West as well as children and horses is evident in her work. She describes her technique as expressive representational art. She claims her greatest challenge is bringing the beauty of her subjects to life on a canvas. Her greatest source of inspiration comes from her faith in God who has given her the skill and ambition to paint since childhood. She often reflects on life back in the Little House on the Prairie which was one of her favorite shows as a child. The simple way of life when people actually enjoyed the simple pleasures is what she wants to convey to her viewers. Her challenge lies in capturing the innocence and beauty of her subjects to glorify the Creator, who in her opinion is the greatest artist of all. Carla’s originals can be seen and purchased in the following prestigious galleries across the USA: The Fredericksburg Art Gallery in Texas, the Germanton Gallery in North Carolina, the Concetta D. Gallery in New Mexico, Cutter & Cutter Gallery in Florida, Studio Gallery in Texas, and Gallery One in Ohio. 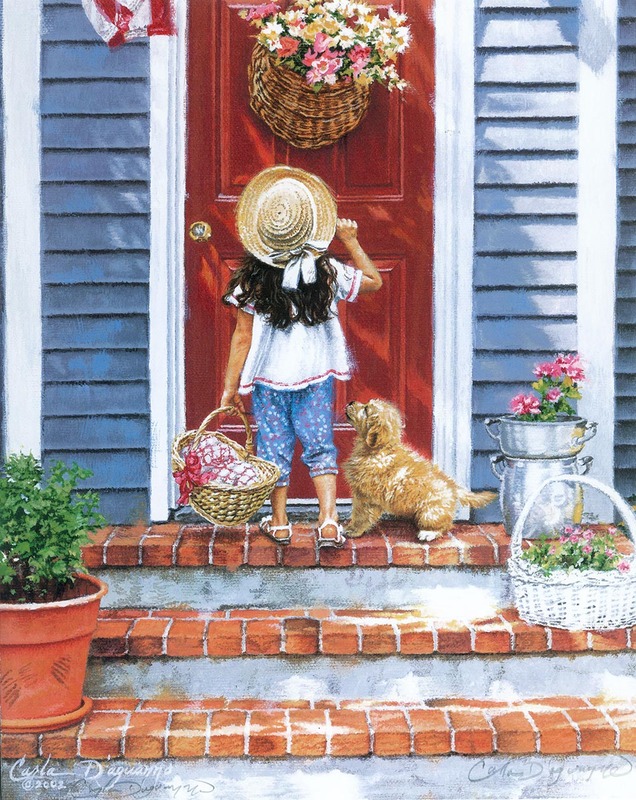 Several of her images are now being licensed on puzzles, greeting cards, prints, calendars and other products being sold in the U.S. and Europe. Canvas or paper prints of her work can be purchased through Great Big Canvas.